When you’re this cute, the world tends to cut you a little slack. When we adopted Charlotte earlier this month, I knew we had a lot of work to do in terms of unlearning bad habits and trying to teach new, good ones. That much is true. But what I never anticipated is that we’d go through a middle-of-the-night routine not unlike having a newborn. Which explains why I’m routinely up between 1 and 2 a.m. walking our little terrier around the block so she can go to the bathroom. Charlotte came to us with a recent past that included sleeping each night in a kennel, so I figured that meant she was down for the night. No matter if we put her to bed at 10 or 11 p.m. or close to midnight — and even if she relieves herself before doing so — she will be up in two or three hours, barking to be let out. One might think I’d take the opportunity to complain. But I won’t. The way I figure it, one of two things is true. Either she’s playing us or she really does have a tiny bladder. I’m giving her the benefit of the doubt because each and every time we have that middle-of-the-night walk, she’ll pee and poop. The other issue is her behavior on the leash. During daylight hours, Charlotte can be like a bull out of a chute. There are just so many sights and smells to tempt a little terrier, whether it’s a squirrel, a bird, another dog or who-knows-what-scents in the grass and leaves. We’ve taken her to obedience classes but so far there’s not much change — and, frankly, I’m not surprised, given that she was living on the streets before she got picked up by the animal shelter folks and subsequently moved to two or three short-term places before she wound up in our home. After midnight, she becomes much calmer. In the dark wee hours, there is less visual and aural stimulation. She’s more responsive and — maybe this is wishful thinking — appreciative of the relative quiet. 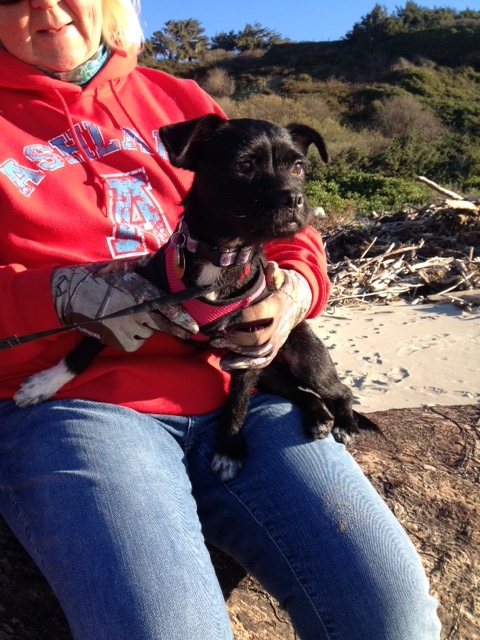 Charlotte’s first trip to the Oregon coast. Maybe that’s why I’m not as put out as one would expect. Several times I’ve found myself embracing the experience — the one-on-one time with our rescue dog, knowing we’re the only ones out at that hour, and reminding myself that things could be a lot worse if she were unmanageable in other ways. I’m sure we look pretty funny. I’ll stagger out the door in pajama bottoms, hoodie and slippers or, if the weather is warm, a ratty T-shirt and baggy shorts. Charlotte, meanwhile, is all but invisible with her jet-black coat. Once we’re inside, all is forgiven. I’m glad we chose to give this little runt a home. With her playful spirit, she makes it a cheerier place. After last week’s shoutout to Fleetwood Mac, it seems only right to do the same for JT. I’m hardly in the sweet spot when it comes to Timberlake’s target demographic, but that doesn’t mean I can’t appreciate his many talents. Far more than a musician, he’s a performer. He sings, dances, composes, and on top of it all, he acts. He’s funny as hell on SNL and he’s played serious roles, too, in movies such as “The Social Network” and “Inside Llewyn Davis.”. Because he’s so talented and so recognizable, the poor guy can barely go out in public. I remember reading about that in Esquire a few years ago, when the writer Chris Jones accompanied JT to a Comic-Con convention in San Diego, dressed up as Ernie (JT) and Bert (Jones). Justin Timberlake and I are standing in our underwear in his hotel suite. He’s wearing white boxers and a wifebeater. I’m wearing plaid boxers and back hair. We met maybe two minutes ago. “I can’t believe how quickly you got my pants off,” I say. “It’s a gift,” he says. Here’s to one of the most magnetic performers of our time. It’s hard to believe that five years have passed so quickly since Lori and I experienced what may have been the most exciting and exhausting week of our lives. In the space of just seven days, we traveled to southern Oregon for the wedding of our youngest son, returned home to celebrate Thanksgiving with our good friends Sue and Eric Wilcox, and moved out of our home of 23 years and into the townhouse where we live now. It felt like our emotions were batted around like a piñata. But I wouldn’t trade that roller coaster of a week for anything. 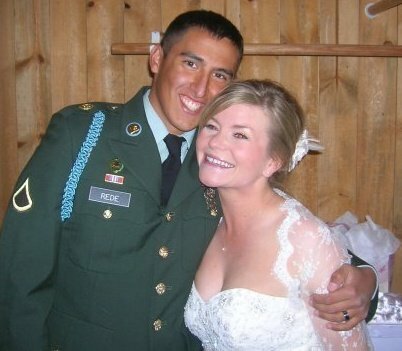 On Sunday, Nov. 22, 2009, our son Jordan married his sweetheart, Jamie Lynn, in a country-themed ceremony that took place between two oak trees on the Lake Creek Historical Society grounds, about 20 miles northeast of Medford. Jordan had enlisted in the Army a year earlier. 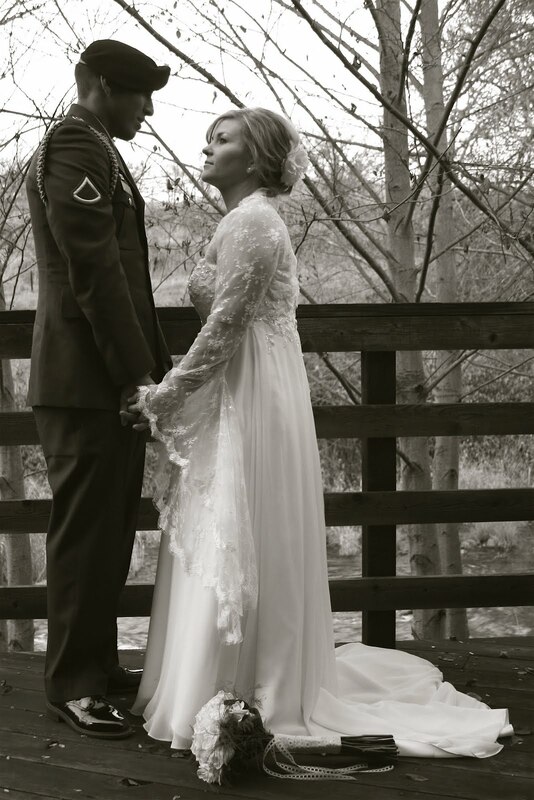 He flew back to Oregon from Fort Bliss in El Paso, Texas, and right after their honeymoon in historic Jacksonville, the newlyweds hit the road to return to the base. Lori and I drove home to Portland on Monday, the 23rd. The next day we found ourselves in a title insurance office signing documents to close the sale of the home where we’d raised our three kids in the Grant Park neighborhood. This was 2009, a year into the Great Recession, so we felt fortunate to find a buyer at a decent price. We had planned to downsize, but we never expected the home to sell after just two days on the market. And we never imagined the sale would close two days after the wedding. Two days later, the holiday arrived. With nearly all our belongings already packed up, Sue and Eric invited us to join their families for a traditional turkey dinner with all the trimmings. Somehow, they managed to fit 27 people around the dinner table (er, tables). 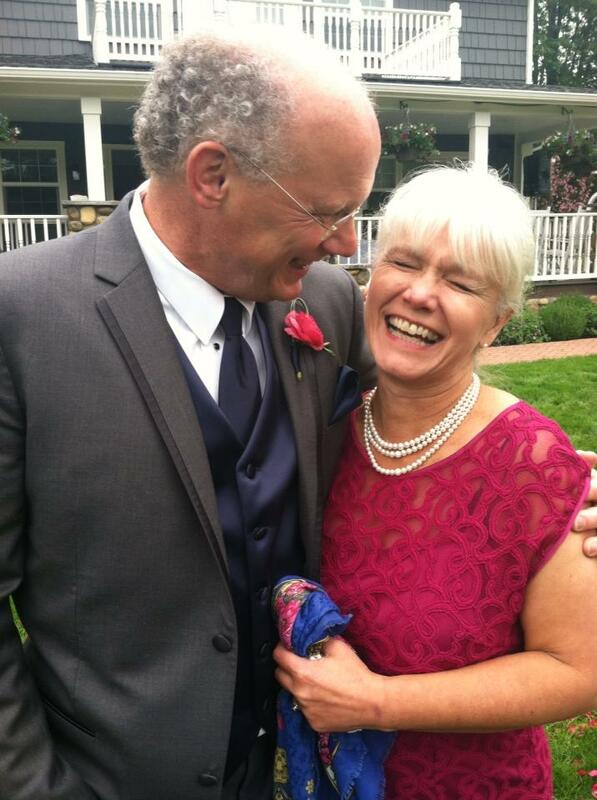 Friends, neighbors and saviors: Eric and Sue Wilcox at the May 2013 wedding of their eldest child. On Friday, we sold a few furniture items and on Saturday we went ahead with the move. I remember being dead tired and emotionally overwhelmed at the sight of a completely full townhouse, with almost nowhere to move. I also remember Eric and Sue coming to the rescue when the buyers showed up promptly at 5 pm, wanting to move into the house we hadn’t quite yet vacated. Our friends came over with their pickup and helped us toss a mountain of clothing into the bed of the truck. Their holiday hospitality was greatly appreciated, as was their offer of help on moving day. Fittingly, this weekend we had reason to recall their generosity — and thank them again — when the Wilcoxes came over for dinner and a board game Saturday night. I think all four of us were just a little dazed to realize we’ve been here in our new home for five years. We’ve certainly settled into it, as well as the neighborhood in general. We love where we live — both the physical space and its location in an urban neighborhood two miles from the city center. Perhaps best of all, our two oldest children, Nathan and Simone (and his girlfriend Sara and her wife Kyndall), live just a few miles away from us in Portland, while Jordan and Jamie reside 140 miles north in Spanaway, just outside of Tacoma, Washington. Five years ago: Newlyweds Jordan and Jamie on a crisp autumn day. Jordan completed his four-year enlistment in 2013 and has only a few months remaining on his commitment to the Washington Army National Guard. He’s going to school full-time at St. Martin’s University outside Olympia and Jamie is working as a licensed veterinary technician. And a final note: Jordan and Jamie celebrated their fifth anniversary with a weekend stay in Leavenworth, a town of about 2,000 residents in north-central Washington that’s known for its Bavarian charm. Sweet. Fleetwood Mac is playing a concert in Portland tonight. I can’t be there, but I can do the next best thing, which is to experience it vicariously. Seriously, one of the the best live shows I’ve ever seen. This year’s tour has Christine McVie back with the band on keyboards and vocals, which I’m sure only makes the whole experience even better. Our budget won’t allow for a repeat, so I’ll gladly turn to YouTube. That was pretty much the vibe at Fleetwood Mac’s concert at the Moda Center on Saturday night; five senior citizens touring again for the first time in 16 years, playing their hits like time stopped and it was 1979 again, with more hugs and without all the cocaine. Jamie France was crowned Miss Teen Oregon-World in 2009 as a high school senior. Now 23, she was charged this week with possession of meth, heroin and a controlled substance. That’s the kind of headline that turns readers into rubberneckers and invites ridicule. 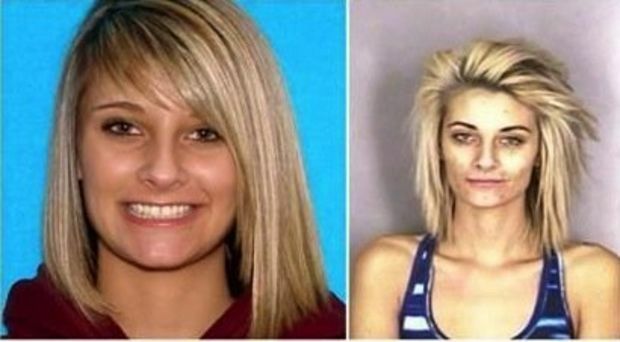 But behind every set of mug shots like these lies a sad story. In this case, it’s the sudden freefall of a former teen pageant winner who was one of three people arrested this week after a raid where cops found heroin, methamphetamine, cocaine and hallucinogenic mushrooms. Just five years earlier, Jamie France was a high school senior who was crowned Miss Teen Oregon-World. On Tuesday, at age 23, she was charged with possession of meth, heroin and a controlled substance. Earlier this year, an astute reader pointed out, she was one of two drivers who were both cited for DUII following a head-on crash in the wee hours on a major highway about 25 miles west of Portland. How, when and why a young woman of such promise got hooked on nasty, hard drugs is baffling. But the takeaway for me is the same as what I experienced a day earlier, when I was reporting on the suspicious death of a 39-year-old man whose body was found in a car in a ditch outside a small, desolate town in Kansas. In short, a life gone bad. And why would I be reporting on a dead man in Kansas? Turns out the guy was originally from Portland. Find out what you can about him, my editors said. See if you can talk to any of his Portland relatives. In short order, with the help of our crack news researcher, I learned the man had been sentenced to prison two years earlier for dealing meth. He’d been put on probation in lieu of a prison sentence, but had absconded in late October. Local authorities in Kansas said they had identified three “persons of interest” in his death. Hmmm. Might these suspicious characters have equally sketchy backgrounds? Might they also be involved with hard drugs? I called the man’s aunt in Portland, offered my condolences and asked, gently, what she could tell me about her nephew. She hadn’t seen him in more than 20 years, she said, but she knew he’d been in trouble. He’d done 10 years in a Idaho prison for grand theft, she told me. She was aware he’d been busted in Kansas. Her nephew left Portland shortly after high school. Never married but had a girlfriend and an adult daughter from another relationship, both living in Missouri. The aunt said her sister-in-law had simply quit being a mom to this guy and his brother when they were still kids. Other family members stepped in to raise the boys. Things hadn’t turned out much better for the other brother, she said. It was a sad story, she said with a raspy voice, but not uncommon. I agreed, thinking of countless inmates across the country. How so many lives have gone bad. How each of their families have had their hopes and hearts broken. “How will you remember your nephew?” I asked. I hung up the phone, consulted with my editors. Forget about it, they said. No need to flesh out a story on a methhead with tenuous connections to Portland. No need to subject a family to further pain. It was the right call, of course. Barely 24 hours later, news of the one-time teen pageant winner crossed my screen. Even before I saw the before-and-after photos, and even before I read the details of her arrest, I knew how I’d react. – The U.S. prison population is more than 2.4 million. – That’s more than quadrupled since 1980. – That means more than one out of every 100 American adults is behind bars. – About 14 percent of the prison population is in federal prison. – The single largest driver in the increase in the federal prison population since 1998 is longer sentences for drug offenders. Looking south at low tide on Winema Beach. We should visit the Oregon coast more often. Last two times we’ve gone, we’ve enjoyed brilliant sunshine and dry weather. We hadn’t been there since May 2013, so iwe were way overdue for a return visit. This past weekend, we made it back. And once again we were the guests of our longtime friends, Tom and Elsa Guiney, whom we’ve known since college. Lori and Elsa: A friendship that began as college roommates more than 40 years ago. 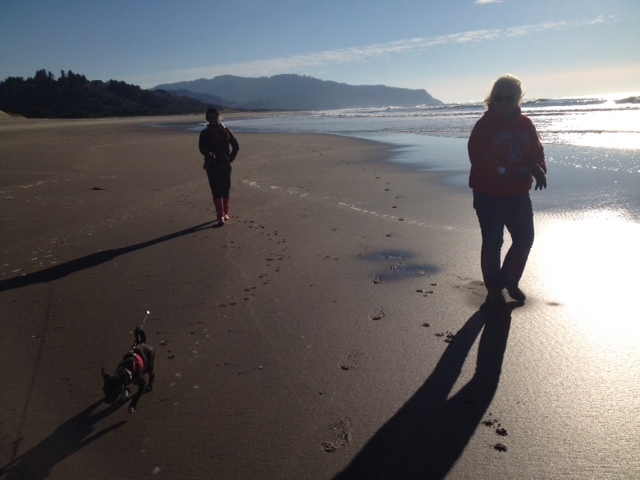 They had us over for two nights at their beach getaway just south of Pacific City, and it was a relaxing time. We slept in both days, walked on the beach, shopped at a local thrift store, prepared two delicious dinners, and played cards and a board game. It was Lori’s and my first time playing canasta, a challenging game that I’d like to try again sometime. Charlotte’s senses come alive at the ocean’s edge. We had our two dogs, Otto and Charlotte, and they had their one, Maggie — and all three got along just great. 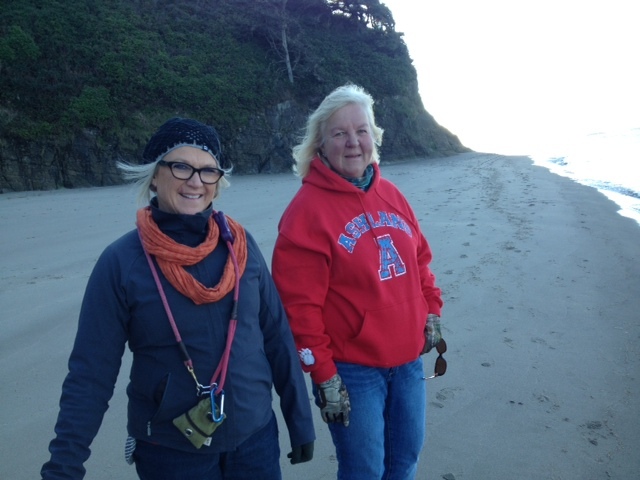 We brought ours on the long walk on Winema Beach, which ended at Nestucca Bay, where we saw seals feasting on a crab pot. First, we drove just a couple miles north to the Nestucca Bay National Wildlife Refuge and joined the crowds of people who flocked to the site hoping to catch a glimpse of a rare bird rarely seen in the lower 48. Yes, I’m talking about the tundra bean goose — a bird with an unlikely name and an even unlikelier journey from its native habitat in northern Asia and Europe. You wouldn’t think looking at a plain, mostly brown bird would be such a big deal but I know all four of us kinda felt like we were in the presence of a rock star — the only one of its feathered kind in an emerald field of Canada geese. The Oregonian’s Kelly House wrote about the wayward goose and the love it was getting from birders. You can also see a photo gallery here. 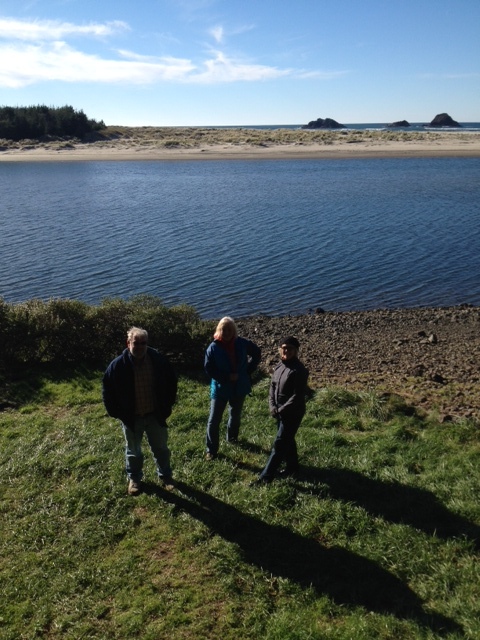 Tom, Elsa and Lori strike a pose on the banks of the Salmon River near its confluence with the Pacific Ocean. Second, we turned around and headed south to Cascade Head, a popular hiking spot that’s owned by the Nature Conservancy and also home to rare plants, wildlife and grassland. 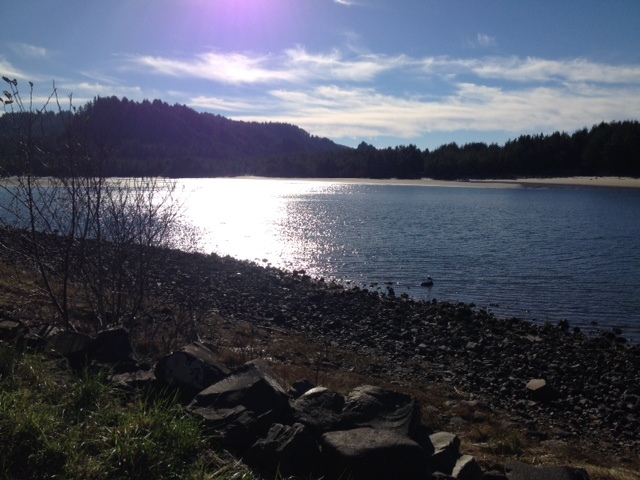 We didn’t do any hiking, but we did walk along the Salmon River, which feeds into the Pacific near Cascade Head, and enjoyed the warmth of the sun. We were there at the coast not even 48 hours. But the visit was soothing for the soul and satisfying for the tummy. Nothing like a picturesque getaway to get you back in touch with the understated beauty of this part of Oregon. Those breaking waves are mesmerizing and the chilly night sky is chock full of stars that you rarely see because of the city lights. Here’s hoping it won’t be 18 more months before our next visit to the coast. 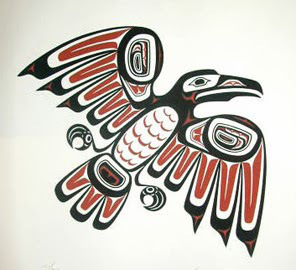 November is Native American Heritage Month and a friend of mine is posting a blog a day in honor of it. 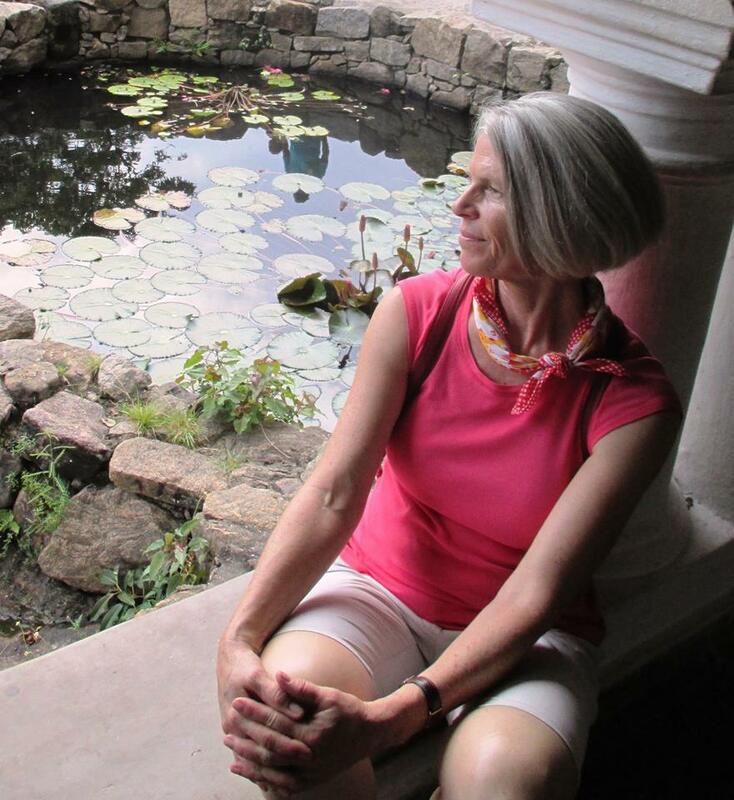 Knowing how much work goes into curating a month’s worth of guest blog posts, I tip my hat to Cynthia-Lou Coleman for devoting precious time and energy to such an ambitious endeavor. Cindy is the Portland State University professor who several years ago invited me to teach a weekend class called “Introduction to the Blogosphere.” From that class in the spring of 2009, the original Rough and Rede blog was born. 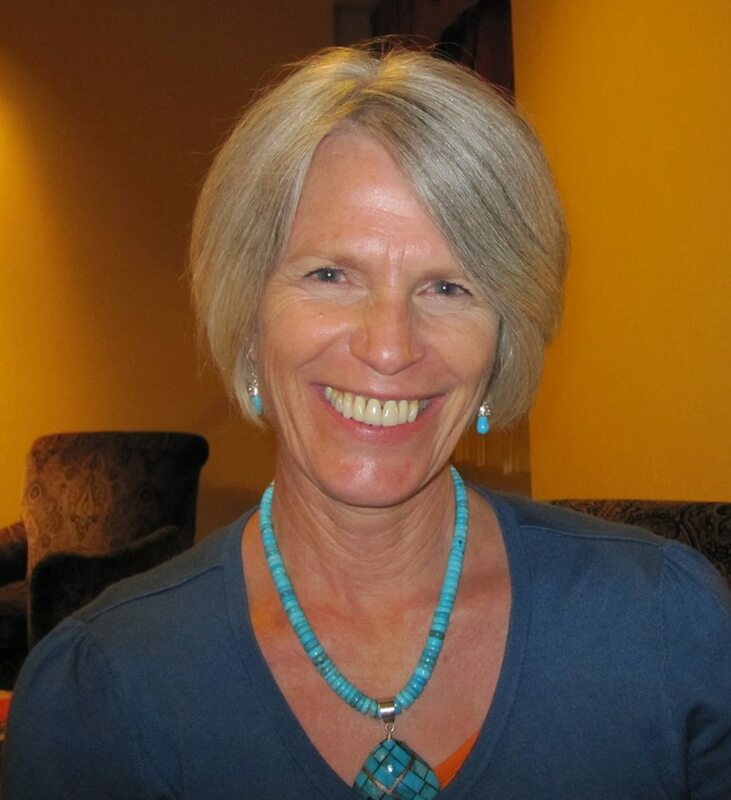 1) Explore more of Cindy’s posts, as they are all quite interesting and informative, not to mention well-written. In summer and fall mornings a flock of crows—a murder of crows—flies over our roof, headed north toward the Columbia River. We reckon they’re flying toward food. They shout at one another and sometimes a sentinel squats in a high branch blaring commands at the troops. At dusk the murder returns south, cruising aloft, heading homeward. Portland crow-parents protect their young by dive-bombing at passers-by. In my neighborhood a kind soul nails a poster to a tree each spring that warns walkers and joggers of kamikaze flyers. Better yet, wear a helmet. A few weeks ago, when I was crossing a street in downtown Los Angeles, I heard what sounded like a woodpecker striking a pole. Looking up, I saw a crow drumming a traffic light. My relationship with crows is complicated. I’m not a fan yet I cannot escape them. Crows are embedded in my life. Their cries annoy me and their armies frighten me, but they have decided to protect me. They appear without invitation in my dreams and leave their feather offerings in my wake. No matter how hard I try to evade them, crows always find me. I wish my Indian name was exotic. Mysterious. Bewitching. Eagle Heart. Brave Bear. White Hair. My Lakota family members call me Eshta Toto (Blue Eyes). But I’m destined to be identified with crows. My Indian colleagues gathered to remember my mother when she passed a few years ago and my friend Cornel sang a heart-felt offering to Wakonda. As I embraced each person an electric pulse ran up my spine and through my hair. A blanket was placed on my shoulders and Cornel said the blue and white colors reminded him of me. Right in the middle of the blanket is perched a crow. Former Secretary of State and U.S. 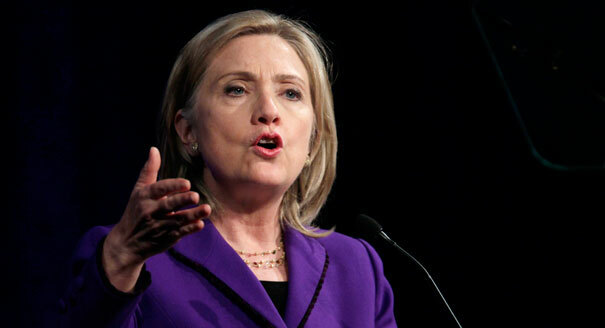 Senator Hillary Clinton. It felt good last week to have the 2014 midterm elections over and done. But soon after the votes were tallied and the winners and losers escorted off the stage, a sobering realization set in: Now begins the unofficial coverage of the 2016 presidential election. Before we know it, we’ll see the hopeful and the hopeless hanging out in New Hampshire coffee shops and rubbing elbows with the locals in Iowa. But before the posturing begins and the onslaught of negative advertising sets in, I do want to point out two smart pieces of commentary on the presidential primaries. Charles P. Pierce, political columnist for Esquire, challenges the conventional wisdom that “a cleared field” for the presumptive Democratic candidate is a good thing for the party. Waiting for Hillary Clinton to decide — will she run or won’t she? — strangles debate, he says, and prevents the party from even considering progressive alternatives like Maryland Gov. Martin O’Malley and Vermont Sen. Bernie Sanders, an independent who caucuses with the Democrats. Meanwhile, the Republicans have the opposite problem — no clear front-runner and a raft of second-tier possibilities. Ross Douthat, a New York Times columnist, says the GOP would benefit tremendously if the primary is winnowed early and two of their most promising, relatively young candidates emerge from the pack. Having Kentucky Sen. Rand Paul and Florida Sen. Marco Rubio outline their visions for where the party ought to go in the future and how they would get there would help determine what kind of party the Republicans want to be. Republican U.S. Senators Marco Rubio of Florida and Rand Paul of Kentucky. 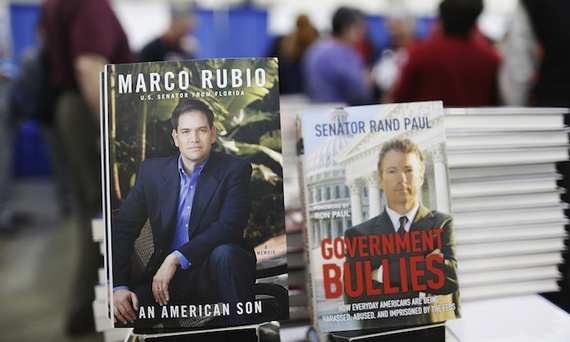 Rubio and Paul are not necessarily the most qualified of the Republican contenders, but “they are both deeply engaged with the challenges that would await a Republican president in a way that most of their potential rivals currently are not,” Douthat contends. “Rubio has gone farther than any other likely 2016 contender in embracing what’s been dubbed ‘reform conservatism’ — a vision of domestic policy that would overhaul the tax code and safety net to support work, family and upward mobility. “Paul, meanwhile, embodies a more libertarian approach to conservative reform, in which the Republican Party would shed its ‘party of the rich’ branding and reach out to new constituencies (minority voters and millennials especially) by focusing on issues — criminal justice reform, civil liberties, corporate welfare — where a critique of big or heavy-handed government might be unexpectedly resonant. I dread the long slog of made-for-TV campaign events and attack ads as much as anybody. But I would welcome more than a one-horse race on the Democratic side — if for no other reason than to keep Hillary sharp and give her an opportunity to demonstrate that her heart is in it. Similarly, I would love it if the Republicans offered more than “an idea-free zone,” as they did in the 2012 primaries, and put forth at least two strong candidates who could begin to justify the midterm victories handed to them by millions of disenchanted voters. It’s a good thing I’m adaptable. At least, when it comes to work and career. I’m starting a new job today as the “Work Life” beat reporter for The Oregonian. I’m looking forward to the opportunities that come along with a fresh start and a fascinating topic. But before I look forward, I want to look backward, too, just to remind myself of the astounding breadth of change that my co-workers and I have been through in just the last two years. To be sure, I’ve seen plenty of change during a career that in 2015 will mark 40 years in journalism. But what industry doesn’t adapt to changes in consumer tastes, economic conditions and production processes? At the risk of sounding like a museum piece, I’ve gone from the days of manual typewriters, scissors and glue pots to the first primitive desktop word-processors and clip-on pagers to today’s smartphones, apps and blog tools that enable instant communication – and digital publication – anywhere within range of a WiFi connection. And, no, I’m not going to belabor the seismic shifts in technology, reader preferences and revenue challenges that have turned the proverbial ship away from our glorious newsprint past and toward the present-and-future realities of online journalism. Rather, this post serves as something of a milestone in recapping changes and transitions I’ve endured or embraced since 2012 began. January 2012: Working as a community engagement specialist, I help to launch and nurture the Oregonian News Network, a collection of nearly 60 independent blog partners we featured on OregonLive.com to provide news, sports and feature content as a complement to articles and photos produced by our own staff. 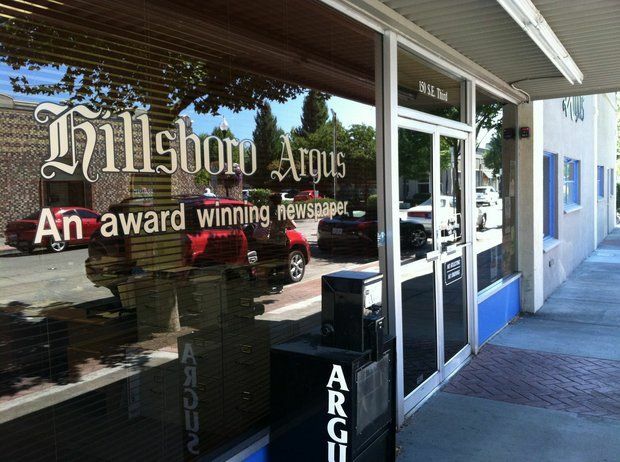 February 2012: I start work as a reverse commuter, traveling from Portland to Washington County to become the Hillsboro Argus opinion editor – a one-man department, writing editorials and columns, soliciting guest commentaries, planning content of the weekly editorial page, managing our Twitter and Facebook accounts. I routinely take the light-rail train to and from work. October 2012: I become the Forest Grove Leader opinion editor as well – taking on identical duties as in Hillsboro in a community at the westernmost edge of the metro area’s urban growth boundary, about 33 miles from Portland. Because the light rail ends in Hillsboro, getting to Forest Grove means driving my ’67 Bug back and forth. June 2013: The Oregonian announces it will go to four-day home delivery. October 2013: This is when things get interesting – or crazy. 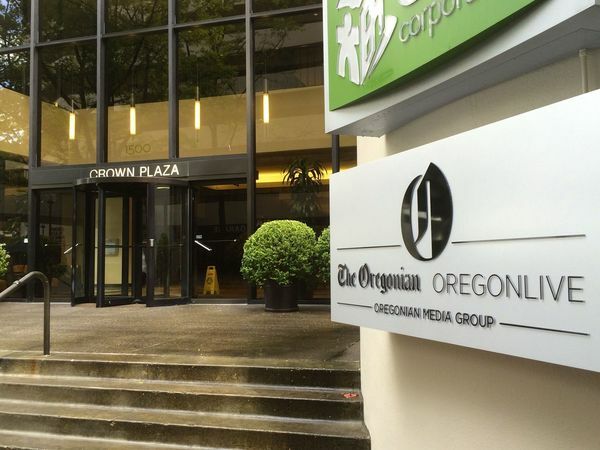 A new company, Oregonian Media Group, begins operation, succeeding the Oregonian Publishing Co., which had published The Oregonian since 1850, a year before Portland incorporated and before Oregon became a state in 1859. A second company, Advance Central Services Oregon, is established to provide production, packaging, and distribution support for OMG. OMG continues to publish The Oregonian and three community newspapers in Washington County, including Hillsboro and Forest Grove, but commits to a digitally focused future built around the online news site, OregonLive.com. 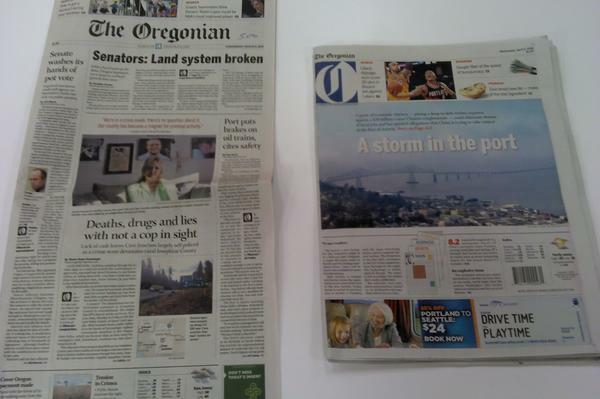 April 2014: The Oregonian switches from the traditional broadsheet format to a more compact tabloid size. Of course, so do the Argus and the Leader. 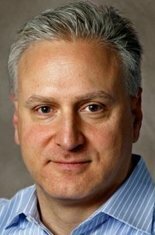 May 2014: Editor Peter Bhatia, whom I worked with closely during my 11 years as newsroom recruitment and training director, leaves the paper to teach at Arizona State University. July 2014: Mark Katches, a national leader in investigative journalism, is hired as the new editor and vice president of content for OMG. Also in July, The Oregonian staff moves to smaller, sleeker leased space in a modern office building near the waterfront, leaving behind fond memories of an ink-stained past – and six Pulitzer Prizes won since 1993 — at 1320 S.W. Broadway, The Oregonian’s home since 1948. August 2014: OMG sells the Hillsboro Argus building, prompting us to quickly pack up and move. Features staff are assigned to work out of Forest Grove. News staff, including me, double up with our colleagues at another community newspaper in Beaverton. The light rail line is located just far enough away from the Beaverton office that I become a regular commuter by car. Mark Katches, formerly editorial director of the Bay Area-based Center for Investigative Journalism. October 2014: The new editor, Katches, announces a comprehensive reorganization of the newsroom that devotes more resources to covering broad subject areas of wide interest and places less emphasis on traditional news appealing to specific communities. The new beats include: Family & Parenting; Faith & Values; Health & Wellness; Environment & Nature; Shopping; Growth & Development, Diversity & Change,. To accomplish this, several editors and reporters, including myself, are reassigned from suburban offices to work out of the main newsroom in Portland. I learn my job is being eliminated, but I land on my feet with a successful pitch to cover the newly created Work Life beat. I’ll do stories that focus on workplace issues across the metro area, centered on where and how we work today, and what tomorrow will look like. November 2014: I work through Election Day and beyond to wrap up the final print editions of the Argus and the Leader and write farewell columns for both publications. Today I start as the Work Life reporter, joining four other reporters on a team with an editor I greatly respect as a talented journalist and peer. That’s a ton of change, right? So, how do I feel about all this? Well, yes. Though I would have been happy to continue as opinion editor, I see a lot of positives in this newest transition. I’m returning to the main newsroom to work in a modern office environment with a goal of helping to build a stronger future for our company. I’m going to work with an editor I trust. I’m going to cover a beat I’m genuinely interested in. I’m going to work alongside other reporters in their 20s, 30s, 40s and 50s who all have – or soon will gain – expertise in their subject areas. Just being around them will be good for the creative process. I’m going to have a lot of latitude in the stories I go after. I see the workplace as a lot like schools. 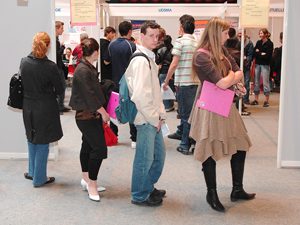 Virtually everyone has had direct experience in a classroom. And virtually everyone has worked, will work or is working. I figure there ought to be a lot of reader interest around workplace culture, employment trends, work/life balance and generational shifts in the workplace. Ultimately, this situation is one where I can view the glass as half-empty or half-full. I choose to see it as brimming with possibilities. Charlotte and big brother Otto. The Rede family has expanded yet again. 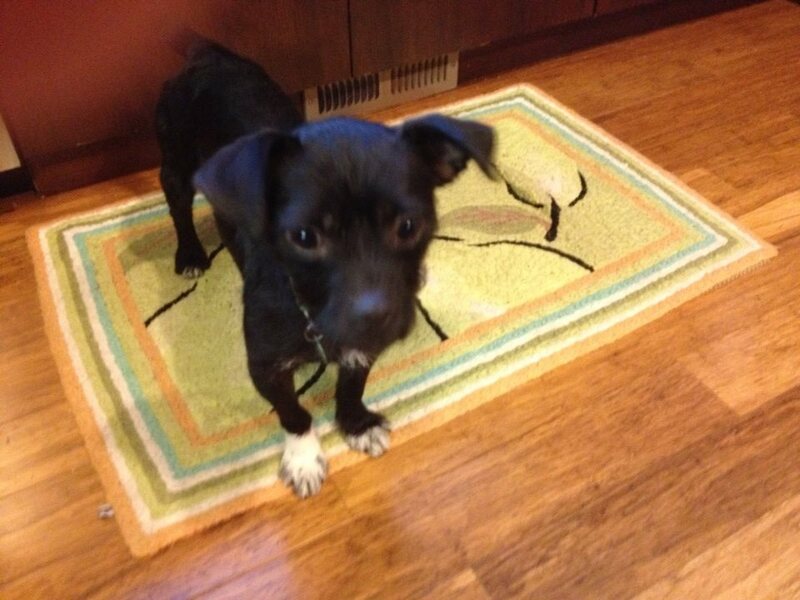 We’re now a three-pet household – one cat, two dogs. 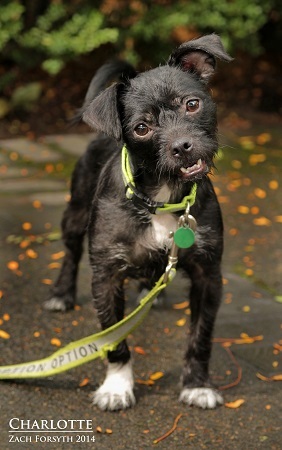 She’s a terrier mix, 2 years old, and brings 11 pounds of high energy plus a sweet disposition. She was housed at the Multnomah County Animal Shelter, a kill shelter, but somehow rescued from there and given another lease on life. She came to us spayed, vaccinated and microchipped, courtesy of the Pixie Project, and quickly made herself at home with us and Otto, our 10-year-old Jack Russell terrier. We had two weeks to decide if she’d be a good fit. It was the third day or so when I knew she’d be a keeper. Early in the morning, I let her out of her kennel. Rather than bolt down the stairs to the front door for a walk, Charlotte stayed nearby. She nuzzled my shin, then rolled onto her back, peering up with a scruffy face and coal-black eyes. In that instant, knowing she’d been a street dog who now was enjoying the comfort of a warm home and the attention (OK, affection) of someone who could be a constant in her life… well, let’s just say I got all misty. 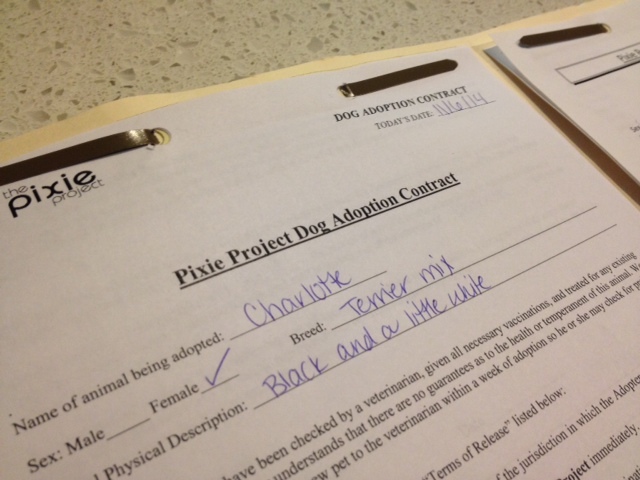 While I was at work yesterday, Lori went down to the agency to sign the adoption papers. So now we have another mouth to feed, a companion to enliven Otto’s life, and a furry princess to jump into our laps. There’s much to look forward to with Charlotte. At the top of the list: training. She’s pretty unruly at the end of a leash, zigzagging crazily down the sidewalk as if she were on crack and pulling a sled in the Iditarod. She’s on extra high alert for squirrels, whimpering and skittering, and tugs so hard she’s often on her hind legs. If she ever got loose, I could imagine her running nonstop to the next zip code. And the way she bursts out of her kennel in the morning? Reminds me of a bull out of a chute. I’ve given her a rodeo name: Black Lightning. Amazingly, though, she is a different dog indoors. She plays with her chew toys, nibbles on Otto’s neck and ears, curls up on a pillow or a lap. 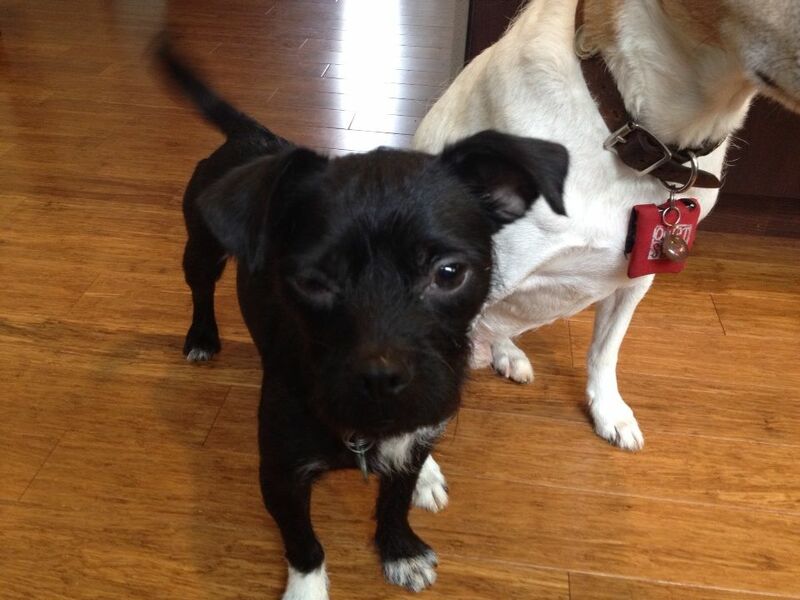 Charlotte is a smart little dog and I’m sure she’ll adapt and thrive. Getting a second dog wasn’t on my list of things to do. But Lori, being the animal lover she is, wanted a buddy for Otto to keep him active and eventually I said yes to fostering, even as I suspected it would lead to adopting. So, Princess Charlotte, welcome to the family.